3 3/8 x 4 1/2 in. 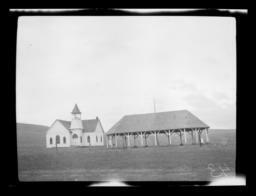 Positive image of a scanned negative from The Burke Archives. Item title from image # 1298. Oklahoma Indians; Baptist (Northern) Mission "Saddle Mountian"
Chapel and Eating Pavilion, Saddle Mountain Mission, Oklahoma, MRL 10: G.E.E. Lindquist Papers, 57, 1300, The Burke Library Archives (Columbia University Libraries) at Union Theological Seminary, New York. Can be viewed at http://lindquist.cul.columbia.edu:443/catalog/burke_lindq_057_1300. Web accessed 23 Apr 2019.